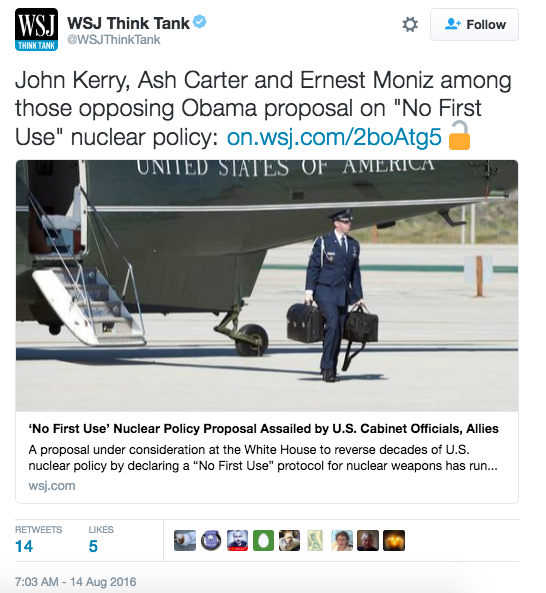 Senator Tom Cotton from Arkansas is among group of leaders pushing Obama to not implement a new “no first use” nuclear weapons policy arguing that it is a major threat to national security. The policy that is being considered by Obama would forbid the U.S. from using nuclear weapons against any enemies first, essentially weakening our capabilities to deter threats of major force before they happen. Sen. Cotton is being joined by fellow Arkansas Senator John Boozman and 28 other Republican Senators in fighting back against the Obama Administration’s potential proposal. Though the administration has not moved forward with the idea yet, the elected officials wrote a letter to Obama this week making the plea for him not to implement the “dangerous and irresponsible” policy. The Senators also pointed out in the letter that Secretary of Defense Ash Carter, Secretary of State John Kerry, as well as Secretary of Energy Moniz all reject such a policy as both Republican and Democratic administrations have done since World War II. President Obama has yet to make a formal decision on whether or not he will implement the policy before leaving office.